Remote Shutdown System uses fail-safe logic. With range of 3+ miles, SignalFire RSDS can shut down assets remotely with fail-safe logic necessary for wireless operation of critical systems found in upstream oil and gas applications. System can be configured with PLC monitoring system or SignalFire Gateway-controlled standalone system that can monitor inputs and generate control command autonomously. Both communication systems incorporate CommSafe software that guards against system failure if wireless communication is interrupted. Hudson, MA — In challenging environments, such as oil fields, equipment often must be shut down remotely. For instance, when a tank that collects oil or water from several wells becomes full, wells must be shut down to prevent overflow. Because of the oil-field layout, the decision to shut-in a well (usually conducted near the tanks) is often made far away from the actual wells. For this type of monitoring and control, SignalFire Wireless Telemetry offers the Remote Shutdown System (RSDS), which can shut down assets remotely with the fail-safe logic necessary for wireless operation of critical systems. Eliminating the need for costly conduit runs, this long-range (3+ miles) wireless telemetry system can be configured with either a PLC monitoring system or a SignalFire Gateway-controlled standalone system that can monitor inputs and generate control commands autonomously. When the SignalFire RSDS is configured as a PLC-controlled system (see Figure 2), a local PLC makes the decision to shut down the remote wells. If monitoring tanks in the oil fields for overflow conditions, tank sensors could be directly connected to the PLC that monitors data and decide if the tank is in an alarmed state. Alternatively, the data could be sent wirelessly, with the PLC obtaining tank-level data from the Gateway. The PLC, then, determines whether the well should be operating or shut-in, and sends the proper command to the shutdown nodes located at the well site. Both RSDS communication systems support a large number of wireless sensors and incorporate SignalFire’s exclusive CommSafe software that guards against system failure if wireless communication is interrupted. In addition to being used extensively in upstream oil and gas applications, the RSDS is ideal for water-tank control and industrial situations where tank monitoring and pump control are necessary. To view a video that explains the SignalFire Remote Shutdown System configuration and describes how to install an RSDS in a well site to monitor a tank battery, download https://www.youtube.com/watch?v=f66hF6tP7zs . For more detailed specifications on the RSDS, visit SignalFire’s website at http://www.signal-fire.com/products/remote_shutdown/ or contact the company at 978-212-2868 or info@signal-fire.com. SignalFire Wireless Telemetry designs and manufactures wireless telemetry products that enable robust, long-distance wireless communication connecting multiple devices in challenging outdoor environments. The company offers the SignalFire Remote Sensing System™ (SFRSS), a robust long-range mesh network specifically designed for challenging, large-scale environments characterizing industries such as oil and gas, agriculture, forestry, water systems, and the public infrastructure. The SFRSS has an open architecture that allows users to integrate many types of sensors to monitor assets such as pumps, valves, and lighting and to extract data for download. 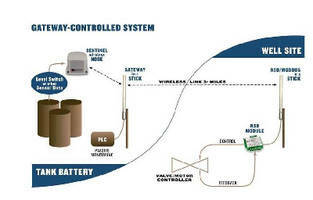 For more information about the company’s telemetry products, visit http://www.signal-fire.com/.